British Chancelor of the Exchequer, Alistar Darling, Banned From UK Pubs. 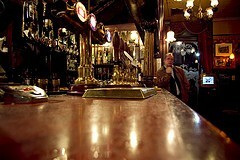 Home \ Blogs \ World \ British Chancelor of the Exchequer, Alistar Darling, Banned From UK Pubs. Angry about tax increases on alcohol, pub owners across Britain are joining together to ban entry to the man they hold responsible. Alistar Darling, the UK Chancellor and the man responsible for raising taxes on alcohol in his recent budget, won't be heading out for a pint any time soon - Certainly not in his hometown of Edinburgh anyway. He has been barred entry from thousands of UK pubs, barred entry by pub landlords angry at what they call his unfair taxation policies. Jason Hughes, owner of the Utopia Bar in Edinburgh, got the ball rolling with a poster mounted in his front window barring the Chancellor of the Exchequer from entry. What started as a joke has gained legitimacy and the movement against the politician now boasts over a thousand members, and an organized front organization promoting their cause. Pub owners say that the tax hikes, which will see alcohol taxation on beer and spirits served in pubs rise at 2% above the rate of inflation for the next 4 years, is "irresponsible" especially when the price of alcohol in supermarkets remains so low. A joke to start but the resentment is real. Conservative Leader, David Cameron sympathized with the publicans in Parliament on Wednesday, saying "Every time you fill up the car, taxes have gone up; every time you buy a car, taxes have gone up, every time the family goes shopping and so on. No wonder every pub in Britain is trying to ban the Chancellor from having a pint." The UK faces substantial alcohol related problems, from underage binge drinking, to endemic levels of drunken violence on nighttime streets. Public health organizations have lauded the taxation increases on alcohol. 1 In the UK - Sad News for Happy Hour?